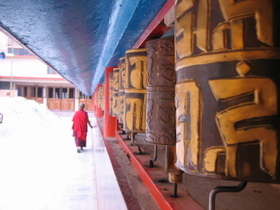 (Left) A monk walks alongside a row of prayer wheels. 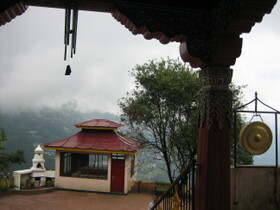 As you rotate a prayer wheel, it says a prayer on your behalf. 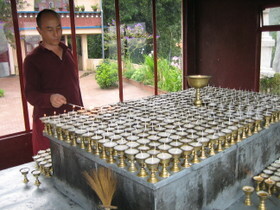 They must be spun clockwise to say 'Om Mani Padme Hum', the most powerful mantra in Buddhism. I tried to look up the meaning of this mantra on the net but couldn't quite grasp the real essence of it. You can refer to this link link if you are interested.